January 17, 2014 By Editor & filed under Blog. What’s in a name? 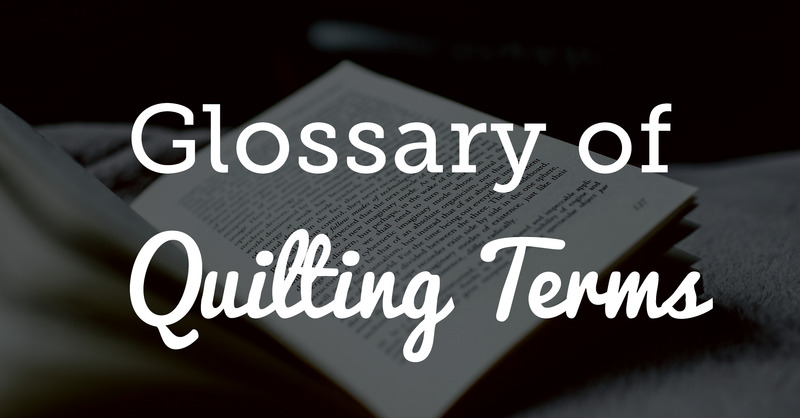 Here’s our ultimate list of quilting terminology. Did we miss a crucial one? Let us know by emailing editor@nationalquilterscircle.com. Applique: A technique where fabric shapes are cut and sewn onto a fabric block or quilt top. Typically a fusible material is ironed to back of shape, and then ironed to fabric. There are many types of applique: Needle turned: this involves hand work where you use a needle to turn edge under and then hand stitch in place. Raw edge applique: technique used to fuse your shape to fabric, then use a decorative stitch to adhere to quilt block. Applique is used to embellish or create interest to a block or quilt. Backing: A quilt consists of three layers. Quilt top is either pieced or a single piece of fabric. The next layer is batting. The bottom layer of a quilt is a piece of fabric that is generally 4 inches longer on all sides, this allows for quilting on long arm machine. Backing fabric can be a single piece of extra wide backing fabric or a fabric of your choice which will be sewn together to the size needed. A few quilters like to piece their entire backing with scraps of fabric, always allowing for the 4 extra inches on all sides of quilt. Example, if quilt top measures 60×60, backing and batting should measure at least 68×68. Backstitch: A stitch used to secure the stitch at the beginning and end of a seam by stitching 4 stitched forward, 4 stitches back and then proceeding with your seam. This technique is done to secure seam and ensure it does not pull apart during piecing or quilting of quilt. Basting: Long stitches used to temporarily hold fabric in place, can be done by hand or by machine. It is used to hold all three layers (quilt top, batting and backing) in place when ready for quilting process. It is not necessary to secure thread knot on either end of stitch, it is merely a way to ensure that your project stays secure and does not shift. These stitches are removed once quilting is complete. Batting: A light weight, warm product used between the quilt top and quilt backing, batting is used for quilts, wall hangings, quilted clothing and home décor. Batting is also referred to as Wadding. It is generally made up of cotton, cotton/poly blend, bamboo, wool, bamboo cotton blend. There are two types of batting: with scrim and without scrim. Bearding: Batting fibers that poke through to the top of the quilt during the quilting process are undesirable. This is caused by bad batting and will create this effect on front and back of quilt. Bearding happens when fibers in your batting pull apart and migrate through the fabric fibers of your quilt. You will most often notice this after quilts first washing. This is why it is important to choose good quality batting. Betweens: Needles made specifically to sew all layers together during the hand quilting process. Also used for hand sewing binding when finishing quilt. Bias: The length or width of woven fabric is considered straight grain, there is no stretch when on straight grain. If you follow the printed salvage on the fabric, this is the lengthwise of your fabric, perpendicular would be your width of fabric. When you chose to cut diagonally at 45 degree angle across the straight grain, you will be on bias. When cutting on Bias you will always have a greater amount of stretch. This can be a casualty in quilting if not handled with care. Your blocks can become distorted unless you pin properly and be careful not to stretch the piece cut on bias. Bias Tape: Pre-made strips of fabric in various sizes that are cut diagonally across the grain to give the fabric some movement so it will turn curves nicely. Used for binding a quilt. Binding: Finishing of the quilt. Long, thin fabric strips that are attached to the borders of a quilt. Blanket Stitch: A simple embroidery stitch used to attach appliqued fabric to a main fabric. Can be machine or hand stitched. Bleeding: When color or dyes from one fabric transfers to another during washing. This is due to hand dyes or color saturated fabrics losing their dyes when they are wet. Most commonly seen when washing vividly colored fabrics, particularly purples and reds. Always best to wash colors separately before cutting and piecing. Blocks: The unit that is designed for a quilt. Generally there will be many blocks in a quilt. A quilt block can be a single piece of fabric cut with a rotary cutter into a perfect square or a block that has been pieced using many pieces of fabric and sewn together using ¼ inch seam allowance. Blocking: When a block is not square, a process that requires wetting and pressing fabric to a proper square block. This is also done using steam to help stretch portions of your block to match other blocks. Borders: Strips of fabric that frame the edges of the quilt. You can have one or many borders in a quilt top. You may also have borders surrounding your quilt blocks, also known as sashing, or as part of quilt block design. Cake Layers: Fabric that is cut into 8-9 inch squares consisting of 3- 4 squares of each piece of fabric in a fabric line, great fun for creating fast quilts, or crazy quilts. Can be bought packaged like this in many quilt stores, it is a great idea to pick up additional fabric in yardage for bordering your quilt. Chain Piecing: This technique is used when sewing many quilt pieces that are identical. Example: sewing 144 – 2 inch squares together. Feed these pieces through your machine, right sides together, sewing consecutively without cutting thread, also called fast feed. Cut thread later when all units have been sewn together. Charm Pack: A variety of a fabric line cut into 5 ½- 6″ squares. Charm packs are sold in many quilt shops, and are packaged by numerous fabric retailers. Number in bundles vary, there are many charm pack patterns. Always remember to choose yardage in fabric for borders or backing. A fun way to buy fabric without spending lots of money. Continuous Line Quilting: A pattern in quilting in which the design line continues from start to finish so you don’t have multiple stop and starts. Corner Square: A square that is sewn to the ends of the top and bottom border before added to quilt. Side borders will already be sewn on quilt when adding top and bottom borders. Corner Triangle: The four triangles set in the corners of a quilt that is set on “Point.” These are half square triangles; the straight of grain is on the short end of triangle. Cornerstones: A name given to a small block that join the sashing strips together to surround a block or blocks in a quilt top. Crosswise Grain: The threads of woven fabric that run across the grain of the fabric, which runs the length of the bolt. The crosswise grain runs from selvage to selvage. Crosswise grain also runs width of fabric, salvage to salvage. Drape: This is the way your quilt will feel after it is quilted, does it drape over your arm in a soft, comforting way? Your batting choice as well as how much quilting you do will determine how your quilt drapes after you’re done quilting it. Higher quality batting are able to take more stitches and still retain their soft, cozy feel, whereas cheaper battings will turn to a cardboard feel. Ease: Distributing the fabric evenly while long arm quilting so quilt lies flat. Commonly referring to quilt borders that are not measured properly. Echo Quilting: Echo or Shadow quilting is a technique where quilting is done around an outline of an applique piece on a quilt top or around a design or pattern. Then the quilting is echoed again and again around the previously stitched line. Generally, you will use your hopper foot to determine distance between echoes. Continue to do this until block is filled or desired effect is achieved. Fat Eighth: A quarter yard of fabric that is cut in half at the fold. Measures 9″x22.” It produces a “fatter” square piece of fabric, providing more options for use. Fat Quarter: A half yard of fabric that is cut in half at the fold. Measures 18″x22.” It produces a “fatter” square piece of fabric, providing more options for use. Feed Dogs: Teeth like mechanism that sits below presser foot of your sewing machine and moves fabric through the feed as you stitch. Also controls length of stitch. If you drop your feed dogs, you can achieve free motion quilting. Finger Pressing: Walking your finger along seam pressing with your nail or tip of finger to crease it without use of iron. 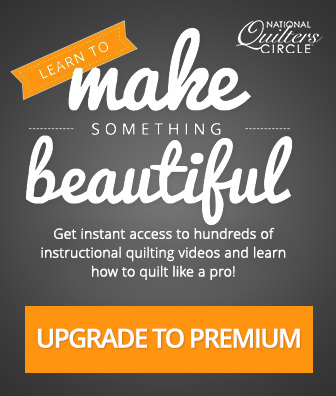 Free Motion Quilting: A process requiring a quilting, darning or hopper foot. Requires you drop your feed dogs so you can move fabric freely in all directions without “draw” on fabric from feed dog interference. Special gloves marketed for free motion quilting help tremendously in controlling the fabric. Many books on the market with lots of free motion designs and techniques. Foundation Piecing: A method used for joining together small pieces of fabric to form a more complicated pattern or design. It is done using foundation paper rather than templates for the construction. Grain: The lengthwise grain of threads running through a woven fabric. Half Square Triangles: A triangle that is created when you cut a square from one corner to opposite corner (45 degree angle). Straight of grain is on short sides of triangle. Two half square triangles are achieved through each square. Interfacing: The term for a variety of materials that are used on the wrong side (either fused or sewn in) of a fabric to give it more stability or loft or whatever the desired effect may be. Jelly Roll: Fabric that is already cut into 2 ½ inch strips and wound into a roll. Used for strip piecing and other various patterns, cut from each fabric in a specific fabric line. Lattice: Same as sashing. A border that is created around blocks of a quilt, most often it is called lattice when your blocks of quilt are set on point (set in to look like a diamond as oppose to a square). Loft: Loft is another word for thickness. The higher the loft of batting the thicker your quilt, this does not necessarily mean the warmer your quilt. There are wool battings that are very thin and super warm. **The thicker your batting, the more difficult it will be to baste. Micro Quilting: Quilting that is done as background fill, small and precise micro patterns. Micro quilting contrasts with your primary motifs and actually makes them stand out in a quilt. This technique adds visual interest, definition and texture. Mitered-Corner Borders: a border that is cut and sewn at a 45 degree angle, giving the appearance of a frame corner. Because it is sewn on a bias, you must be careful not to stretch and distort in sewing process. Negative Space: Unoccupied area that surrounds objector shape in a project. Negative space can be in a block or the area surrounding a block. It encompasses the areas and flows in, around and between quilt blocks, Negative space gives definition and depth to our project making it an essential tool in quilting. This is the area that micro quilting and fills are used to extenuate the quilt by creating movement and added interest to quilt. Notions: Small accessories used to aid in sewing and quilting: scissors, needles, thread, seam ripper, zippers, etc. On Point: A block that is placed at a 45 degree angle, diagonally, on the quilt top. You must be careful when piecing this style quilt, it is very easy to stretch bias and distort quilt. Proper pinning is a necessity. Patchwork: The art of sewing small pieces of fabric together to make a larger fabric or design, then usually quilted to be made into a quilt or bag or other project. Piecing: Process where you sew your fabric pieces together to form a block, garment or quilt. Pressing: An iron is used to press a seam open directly after setting seam. You do not move iron around or use steam, both would cause stretching or distortion of seam. Instead you lightly set iron onto open seam, lift and set again. Repeat until seam is pressed to its entirety. A necessity in obtaining precision in quilting. Quarter Inch Foot: Presser foot that has a guide to achieve the ¼ inch seam. There is also a mark on front and back of presser foot that show ¼ inch markings if you need to stop short ¼ inch this is helpful. Quarter-Square Triangle: Triangle made when you cut a square twice corner to opposite corner at 45 degree angle. Making an X in center of block. Straight grain will be on long edge of triangle. You will obtain 4 triangles from one square. Quilt As You Go: Process where each section is layered (top, batting, backing) before you begin sewing. Add border to top right sides together, batting and backing to back right sides together. Pin and sew seam. Set seam, fold border forward, batting and backing forward, and press. Repeat this process until project is complete. When quilt is finished, it is completely quilted already. Quilting: The process of sewing the three quilt layers together, using stitches in decorative patterns as motifs, or in utilitarian patterns, such as straight lines with bigger stitches. Quilting is generally done by hand or machine and serves three purposes; 1. Secure all three layers to each other. 2. to add to the beauty and design of the finished quilt. 3. To trap air within the quilted sections, making the quilt as a whole much warmer than its parts. Quilt Challenge: Many people making a quilt project with predetermined rules/criteria; a friendly competition. Quilt Frame: Can be a small quilt hoop or a large floor frame that holds the 3 layers of a quilt (top, batting, and backing) as it is hand quilted. Quilt Hoop: Two circles that hold the quilt layers together during quilting process. One of the circles has an adjustment to fit over layers. Quilt Label: A patch or an area on the back of the quilt. Generally the label will have a date, recipient name and name of its maker. Perhaps even a little about the quilt. Quilt Sandwich: The three layers of a quilt: the quilt top, the quilt batting, the quilt backing. This is what a quilt is referred to before binding is put on. A quilt sandwich can also be used when practicing free motion quilting. This is done when you use a 12 inch block of fabric on from and on back with a 12 inch block of batting in the center. Thus, a quilt sandwich. Quilt Sleeve: A strip of fabric that is applied to a quilt to enable hanging, a rod is often slipped through the sleeve. Hand Quilting Thread: Thread used to quilt the three layers together by hand. This thread should not be used in a sewing machine. It is a very thick thread that says hand quilting on label and will leave ridges in the tension guide. Right Side: The “front” side of the fabric; usually the distinctly printed side of the fabric. Rocker Quilting Stitch: Stitch used when hand quilting when you gently rock needle down through quilt and then back up in a running stitch. Rotary Cutter: Cutting tool for quilting has a very sharp round razor like blade. Must be used on a cutting mat and preferably with a quilting ruler. Rotary Mat: Cutting surface that is self-healing. Used with fabric and rotary cutters. Rotary Rulers: Rulers made from Plexiglas type material. They have a raised edge to guide rotary cutter along edge. Running Stitch:A style of stitch where the needle goes in and out of fabric in a continual motion. Sandpaper Circles: Circles made of sandpaper with adhesive on one side. Place adhesive side to bottom side of rotary rulers to prevent slippage. Sashing: Strips of fabric sewn around or between blocks of a quilt top. These strips are generally joined together by cornerstone blocks or sashing squares. See Lattice. Sashing Squares: Squares used to sew sashing together. See Cornerstones. Scrap Quilts: Quilts that are made from various fabrics, often scraps from other projects or clothing. There are many patterns for this style of quilt, or you just start sewing them together and cut them into blocks. Scrim: A term used in batting where a thin layer of polyester is added to the cotton to be needle punched into, this gives stability to your batting so it won’t break apart within your quilt. Scrim adds poly to your batting so it will no longer be 100% cotton. Seam: The line where two pieces of fabric are joined together by sewing them with thread. Seam Allowance: The fabric on the right of the sewing line from raw edge. In quilting it is ¼ inch. This process keeps edge from fraying and maintains a secure seam. Seam Ripper: A tool used for picking or ripping out sewing stitches. Generally one of your most used tools. Selvage:Manufactured finished edge of fabric prevents fraying before it gets to consumer. Selvage should always be cut off before starting the process of cutting your pieces. This is where you can find the name of your fabric line, company that supplied fabric as well as your color wheel… colors that went into your fabric. Serging: A method of looped threads over the raw edge of the fabric to finish the edge to prevent fraying. This is a Fun way to finish wall hangings. Setting the Seam: When you set the iron on the seam before pressing it to the side or open depending on your project. Allows the thread to relax into your fabric and become more secure. Setting: Arrangement of blocks and various fabrics in a quilt. A straight setting is when blocks are placed in vertical and horizontal grid like design. Diagonal is when a block is set on point, resembling a diamond, risk of bias stretch with the diagonal setting. Sharps: Sets of sewing needles for hand piecing or applique, many use this for bindings as well. Side Triangles: Setting triangles used on top and sides of quilt where blocks are set on point. These are quarter square triangles and the long side has the straight of grain. You must be careful when sewing on bias side, as not to stretch and distort. Always pin and use walking foot. Stab Stitching: Process where the needle is pushed (stabbed) to back side of quilt sandwich with one hand and returned to top side with the other hand, pushing needle from back to front. Stash: Fabrics that have been accumulated for projects, or because you really liked it, or because you have a fabric addiction. Stay Stitch: Pre-sewing along the edge of a curve to help prevent the stretching along the “bias” when assembling a garment together. Often used on the curves of sleeves for stability during garment construction. Stencils: Designs that are cut into a plastic template. Stencils are used for marking quilts during quilting process. Stitch-in-the-Ditch: A quilting term used to describe the method of stitching along existing seams in a patchwork piece or quilt top in order to quilt it together with the batting and backing. Straight Cut Borders: Top, bottom and side borders that meet at a horizontal seam. Sew sides on first then top and bottom. Straight Grain: The grain of the fabric that runs lengthwise grain and crosswise grain through the fabric. This is most stable, less stretch. Strip Piecing: A technique where strips are cut and pieced together and then pieced strips are cut to design a block. Used in rail fence quilts as well as many others. Stippling: A technique used in both hand and machine quilting to flatten an area of a quilt and create texture. Stippling is continuous closely spaced waving and curving, resembling a puzzle. In the past it was faux pas to cross over a line, this is no longer the thought. Template: A shape or design that is placed on fabric and used as a pattern to trace or cut around. Often used as an applique when finished. Tension: The amount of “pinching” done to your thread as it flows through your sewing machine. Thicker fabrics need a higher tension (a harder pinch so the thread doesn’t flow out too quickly), and thinner fabrics need less tension (a lesser pinch to let the thread out easily to prevent puckering). Thimble: Protective covering for your finger used during hand quilting or sewing binding and/or applique. Tied Quilt: Technique where a quilt is layered with backing, batting, and top. Generally it is laid out on a large table and periodically tied and knotted with pearl cotton or yarn to hold quilt together instead of quilting it. Generally high loft batting is used with this technique. Top Stitch: The process of stitching on the exterior side of a project to finish seams or folds to keep them in place. Usually paired with a longer stitch length which looks more professional and can make it easier to go in a straight line. Also can be known as Edge Stitching if it is done near a fold of fabric. UFO: A term used to refer to an unfinished object or project. Most quilter have many projects on the table at any given time. Wadding:Batting or wadding is the middle layer of the quilt, adding to the warmth and loft of the after product. Walking Foot: Presser foot attachment that feeds more than two layers at the same rate. It has an even feed which makes it perfect for working with fabrics that are cut on bias. Whole Cloth Quilts: Name given to three single pieces of fabric sandwiched and sewn together in the quilting process. The design is in the quilting. WOF: Width of fabric. Salvage to salvage. You will find this abbreviation in many patterns. Wrong Side: The “back” side of the fabric; usually the opposite side of a distinctly printed fabric. wow all those terms are a bit daunting. I am only a VERY NEW beginner. So new I am still in the thought stage. My new sewing machine has a quilting function, thought it may be nice to make a quilt…..not so sure now. Hi, Sharon. Please contact us at 1-855-706-3538; our Customer Service Team would be happy to assist you! Is there a way that I can chose my own password so I can remember it? Hi, Nancy. Please contact us at 1-855-706-3538; our Customer Service Team would be happy to assist you! As far as I was taught Layer Cakes (or as you called them Cake Layers) are not 8 to 9 inches. They are sold as10 inch squares. And Charm squares as I have purchased have always been 5 inch squares. And quilting what does HF9D OR HF45 mean. Unfortunately We are not sure, what that is referring to. You forgot LOF, length of fabric. Thanks for the list. It is, indeed, handy. Great I info I need this on a printef on a sheet of paper. My own cheat sheet! Or a pin on Pinterest! Thank you for the list. I am pleased to get a new list but it has grown.